I am more than my illness…. …although I know it may not seem that way. I set up this blog because I’d rather vent here, into the void, than burden my friends and family. So yes, this blog will probably deal with a lot of “woe’s me” posts, but like I said: I am more than my illness. So let’s cover a few other things that I am! First and foremost, I am a biology student. I earned my bachelors degree a couple of years ago and realized that the greatest insight it gave me was the knowledge that I do not know nearly enough. So off to the Masters program for me! I have grown so much in the past two years. Yes, it has been hard going to graduate school and dealing with an illness. I have felt overwhelmed at times and have nearly broken at other times. I have had to push off my graduation because of it, but I am doing what I love. Whether I were sick or not, this is what I’d be doing regardless. I also LOVE to read. Currently I’m reading The Bell Jar. I’m not sure what I’ll read next, perhaps either The Westing Game, Catch 22 or A Game of Thrones. Maybe someone can comment and help me decide 🙂 I’ve recently decided that every night I will read before sleep. I saw an article that stated that sleeping before bedtime may help you to get to sleep more easily. I’m always up for more sleep! I want to own a menagerie some day. I absolutely adore animals and plants. Seriously, if you ever saw my room, you would have no doubt that I’m a biologist 😉 I think at last count I have 19 plants (err…18…just because I love them doesn’t mean I have any special ability at keeping them alive..) and three aquariums. All this in a single dorm room! So that’s probably me in a nutshell. 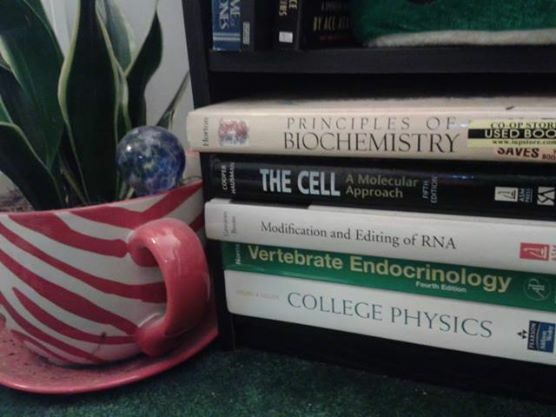 Biology, animals/plants, and books go a LONG way in explaining who I am. I am more than Ehlers Danlos. In fact, I’d say that my disease represents only a teeny tiny portion of who I really am. Perhaps about as much as my eye or hair color. So while this is essentially an Ehlers Danlos (and friends) blog, every now and then I’ll let my other more important aspects out.